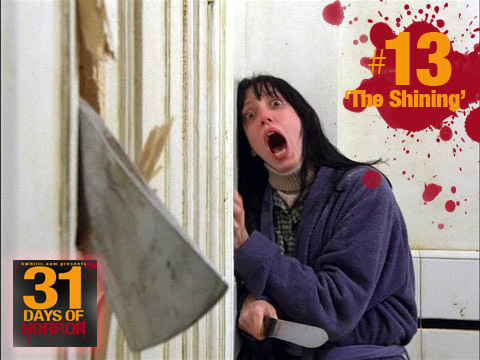 I really didn’t mean to put so many Stephen King stories in our 31 Days of Horror. It just kind of happens. He is the Master of Horror, though, so I guess it makes sense. His best story, “The Shining,” made such a terrifying movie. It’s one that sticks with anyone who sees it. “The Shining” tells the story of writer Jack Torrence (Jack Nicholson). He’s a recovering alcoholic who decides to take a job as a hotel caretaker during its offseason so he can write. He loads up his wife Wendy (Shelley Duvall) and their son Danny and heads to the Overlook Inn. It’s an old, yet grand place. It doesn’t take us long to realize there’s something not quite right about the place. Jack becomes possessed by the place. He’s not writing, he’s growing more and more angry and abusive. And Wendy and Danny are caught in the middle of it. And there’s no way out. They’re stuck in the hotel for the winter. What makes the movie such a brilliant one is you’re never sure if it’s merely cabin fever that has sent Jack over the edge, or is it something more supernatural. Are Danny’s weird visions and psychic abilities just childhood imaginations or is there something more there as well? Director Stanley Kubrick did put his own slant on the story, and honestly, wasn’t the best move on his part. But it’s still a fantastic, chilling horror film. Did You Know? Every time Jack talks to a “ghost”, there’s a mirror in the scene, except in the food locker scene. This is because in the food locker scene he only talks to Grady through the door. We never see Grady in this scene.